Four cities in Saudi Arabia – Dammam, Jeddah, Alkhobar and Riyadh – have become ‘more affordable’ this year, according to online database site Numbeo. 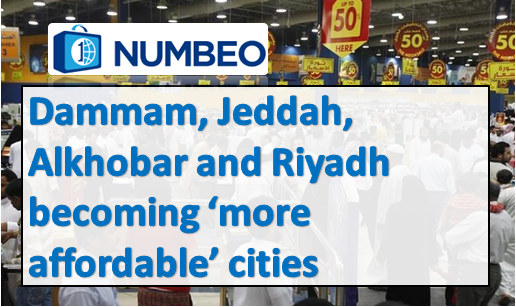 According to Online Survey Company Numbeo Dammam, Jeddah, Alkhobar and Riyadh are becoming more affordable cities in 2017 than previous year. New York is one the most expensive cities in the world due to which all of cities Cost of living is compared to New york.